See more objects with the tag decoration, butterflies, floral, domestic interiors, plants, adornment, foliage, brightly colored, curtain, textile design, bedding, palm trees, fashion, chintz, washable. See more objects with the color lightgrey darkslategrey darkgrey saddlebrown grey or see all the colors for this object. This is a Textile. It was company: Oberkampf & Cie.. We acquired it in 1973. Its medium is cotton and its technique is block printed, yellow and blue applied by brush, on plain weave foundation. It is a part of the Textiles department. 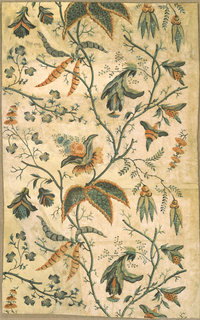 The French were crazy about chintz—Indian hand-painted cottons with wash-fast colors. 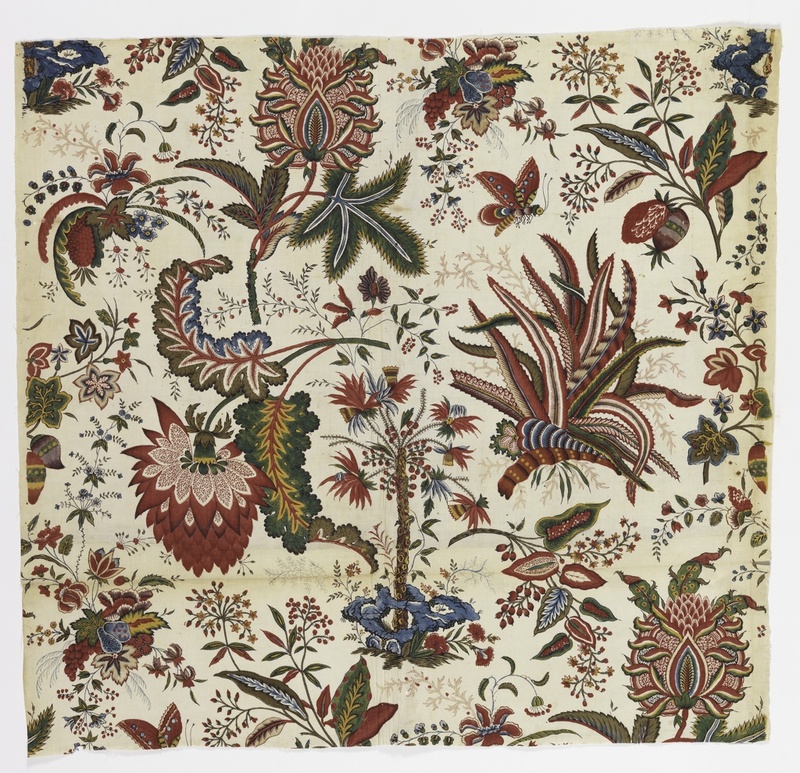 With trade routes flourishing between Europe and India by the end of the 16th century, Indian chintz was sold in Parisian marketplaces as early as 1658, and the fabrics became wildly popular for clothing and interior furnishings. "Fleurs Tropicales et Palmiers" or "Tropical Flowers and Palm Trees", is a French response to the Indian originals, block printed at Oberkampt in Jouy-en-Josas. The pattern is composed of exotic plants like aloe and palm trees, as well as butterflies and brightly colored flora. Although more mechanized than the Indian hand-painted versions, block printing was a time-consuming and labor-intensive process, in this case requiring nine dye colors, four hand-carved sets of woodblocks, resist-dyeing and hand-painting, as well as mastery of the use of mordants—the metallic salts that enable dyes to bind permanently to cotton fibers, ensuring that the fabrics remain saturated in bright color. 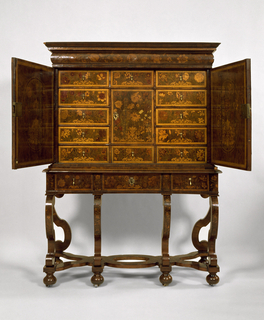 This object was featured in our Object of the Day series in a post titled Tropical Flowers.